XMM Abbreviation of X-Ray Multi-Mirror spacecraft, now called NEWTON. X-ray astronomy Study of energetic processes and extreme physical conditions - high temperatures, winds and accretion disks, neutron stars and black holes. X-rays are generated by several environments: hot gas with a temperature greater than 1,000,000 K will emit radiation through atomic lines and thermal bremsstrahlung; high-energy electrons scattered by low-energy electrons produce X-rays (inverse COMPTON EFFECT); electrons in strong magnetic fields emit SYNCHROTRON RADIATION; and hot stars emit thermal BLACK BODY RADIATION. X-rays are also generated when material such as hydrogen ignites in NUCLEAR REACTIONS. The X-ray wavelength region is around 0.04 to 2.5 nm, but this is more usually expressed as from 0.5 to 30 keV, since X-rays are often measured in energy terms as kilo-electron-volts (keV). Hard X-rays are usually regarded as those in the range 10 keV and above, and soft X-rays lower than 10 keV. Many types of astronomical object emit X-rays, from the Sun, with a CORONA of around 2,000,000 K, to BINARY STARS containing a compact object (see X-RAY BINARY), to galaxies with a supermassive BLACK HOLE at the centre. However, X-rays from astronomical objects cannot be detected from the ground: 10 cm of air at ground-level, or three sheets of paper, will stop 90% of 3-keV X-rays. 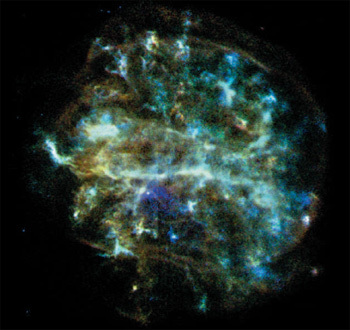 X-ray astronomy This Chandra X-ray Observatory image shows a young supernova remnant in Centaurus. A rapidly expanding shell of gas 36 l.y. in diameter, G292.0+1.8 contains large amounts of oxygen, neon, magnesium, sulphur and silicon. It has a pulsar at its centre. X-ray astronomy began in 1949 with the discovery that the Sun emitted X-rays, and the subsequent study of its general properties, by Herbert FRIEDMAN, Burnight and co-workers, using a Geiger counter on a V2 and other sounding rockets. This work, together with that using the UK Ariel I satellite, built and launched by NASA in 1962, established that high-temperature (about 107 K) plasma was created in the corona during solar FLARES. Solar X-ray studies continued through the 1960s and 1970s with several NASA satellites, including the Orbiting Solar Observatory and the SOLAR MAXIMUM MISSION. The Sun is not a strong emitter of X-rays, so it was a major surprise when Riccardo GIACCONI and colleagues discovered a strong X-ray source in the constellation of Scorpius (SCORPIUS X-1) in 1962 using a sounding rocket. By 1970, after some dozens of sounding rocket flights that gave a total exposure of only a few hours, about 50 individual X-ray sources had been discovered, including the CRAB NEBULA, the galaxy CENTAURUS A, the quasar 3C 273, and a diffuse X-ray emission component (the X-ray background), which appeared to be isotropic at energies above 2 keV. The launching of the UHURU satellite by NASA in 1970 December marked the beginning of a new era for X-ray astronomy. It carried out an all-sky survey resulting in the discovery of more than 400 discrete X-ray sources. More satellites followed, including the UK Ariel V satellite and the NASA COPERNICUS satellite. In 1978 NASA launched the EINSTEIN OBSERVATORY satellite, which carried an X-RAY TELESCOPE with an angular resolution of a few arcseconds. This satellite ushered in a new era in X-ray astronomy. Consisting of a large nested grazing-incidence X-ray telescope, it responded to photons in the 0.1-4 keV energy range. The combination of good angular resolution and high sensitivity led to the discovery of several thousand new X-ray sources during the 2 -year operational life of the satellite. Recent X-ray satellites include EXOSAT launched in 1983, ROSAT in 1990, and CHANDRA and NEWTON, both launched in 1999. There are now more than 150,000 X-ray sources known. X-rays have even been detected from the Moon (reflected solar coronal X-rays) and from comets. X-ray spectra show highly ionized lines of oxygen, iron and other heavy elements, often with so many electrons stripped from the atom that they mimic the hydrogen spectral series. It has been found that many types of ordinary star emit X-rays. BROWN DWARFS have been detected with X-rays from their coronae. A population of WHITE DWARFS has been found to be continuously emitting X-rays because material is being accreted from the companion on to the surface of the white dwarf and burnt, with temperatures of several hundred thousand degrees - a unique situation of steady nuclear burning at the surface of a compact star. X-ray astronomy established that NEUTRON STARS were present in binary star systems; CYGNUS X-1 is one of the best candidates for a system containing a BLACK HOLE. It has revolutionized our understanding of the end of a star's life and of compact objects. The surface of a PULSAR in Vela has been detected in X-rays, as have some other young pulsars. The surface temperature of the neutron star in the Vela Pulsar is around 1,000,000 K. Binary star systems containing a compact object show a variety of phenomena, depending on the mass and geometry of the members. The presence of an ACCRETION DISK in the system means that the X-ray emission can be intermittent (see X-RAY BURSTERS; X-RAY NOVAE). The strange X-ray binary SS433, with its relativistic JETS, was found to emit X-rays. Some 200 SUPERNOVA REMNANTS have been found by their extended X-ray emission, which comes from very hot gas behind the shock front. SUPERNOVA 1987A was observed by ROSAT several times; X-rays were first detected in 1992, becoming steadily stronger. When the ANDROMEDA GALAXY was observed by ROSAT, around 550 sources were detected, about the same number as the bright X-ray sources in our own Galaxy. The LARGE MAGELLANIC CLOUD (LMC) has a source (LMC X-3) that is very similar to Cygnus X-1, with a possible black hole as the compact object in the massive X-ray binary star system. Many galaxies emit X-rays (see X-RAY GALAXY); clusters of galaxies (for example Coma, Virgo, Perseus) emit X-rays from hot intergalactic gas. Observations have shown that the Sun is embedded in a bubble of hot gas around 160 l.y. in diameter, with a temperature of over 1,000,000 K -perhaps heated by a long-past supernova explosion. In Cygnus there is a superbubble of hot (1,000,000 K) gas, with a density of about 0.001 particles/cm3. The superbubble is over 1000 l.y. across, possibly the largest structure in the Galaxy, and this may be the result of a cluster of stars becoming supernovae. X-ray binary Close BINARY STAR system emitting X-rays, either continuously or at intervals. X-ray binaries usually consist of a normal star and a compact object such as a WHITE DWARF, NEUTRON STAR or BLACK HOLE. The UHURU satellite originally showed that some X-ray stars underwent eclipses, revealing that they were close binary systems (for example HERCULES X-1). There are several types of X-ray binary system, with properties that depend upon the nature of the compact object. There are massive (high-mass) X-ray binaries and low-mass X-ray binaries (low-mass implies stars around the mass of the Sun). Low-mass X-ray binaries containing a neutron star tend to be X-RAY BURSTERS, for example SCORPIUS X-1 and Hercules X-1. Low mass X-ray binaries with a white dwarf as the compact object are CATACLYSMIC VARIABLES. When the companion star shedding the material is a massive star (for CYGNUS X-1 the mass is more than 30 solar masses), the star can often be detected optically. The strong stellar wind transfers material directly on to the compact object. X-ray pulsars are usually found in binary systems with high-mass companions. SS433 is an unusual massive X-ray binary, with a possible black hole as the compact object; it shows relativistic JETS. X-ray binary The strong X-ray source Cygnus X-3 is a close binary system in which matter from a normal star is being drawn into a neutron star or black hole. 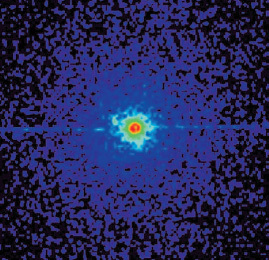 This Chandra X-ray Observatory image shows a halo of emission resulting from scattering by interstellar dust in the line of sight, allowing the distance to Cygnus X-3 to be estimated at 30,000 l.y. X-ray burster Source with intense flashes, or bursts, of X-rays. The bursts have rise times of around 1 second and can last as little as 10 seconds, yet the energy released is equivalent to a week's output from the Sun (or more). A few X-ray bursts have been detected at optical wavelengths. X-ray bursters are BINARY STAR systems in which one star is a NEUTRON STAR. The neutron star is surrounded by a hydrogen-rich ACCRETION DISK from a low-mass companion star (around one solar mass). The hydrogen flows from the accretion disk on to the surface of the neutron star and is burnt to helium (see NUCLEAR REACTIONS). When the amount of helium on the surface of the neutron star exceeds a critical amount, the helium suddenly ignites, causing a burst of X-rays. The temperature can rise to 30 million K at the peak of the burst and 10 seconds later fall back to15 million K. Almost 30 X-ray bursters have been found in GLOBULAR CLUSTERS; for example, the first was found in NGC 6624 (Omega Centauri has five, M22 has four). They are generally found close to the centre of the cluster, where the star density is very high. These X-ray bursters are also thought to be binary stars, with a neutron star accreting material from a low-mass companion star. 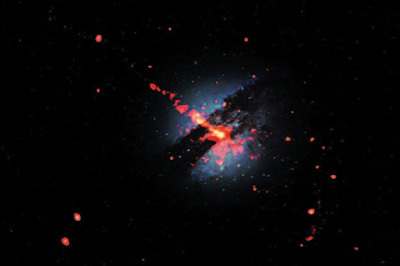 X-ray galaxy Galaxy that emits powerfully in the X-ray part of the ELECTROMAGNETIC SPECTRUM, indicating that it probably has a large or supermassive black hole at its centre, with an ACCRETION DISK. These galaxies include active galaxies (such as NGC 4151 and Centaurus A), SEYFERT GALAXIES, QUASARS and BL LACERTAE OBJECTS, many of which are also radio sources. X-ray galaxies often appear to be merging or colliding systems. X-ray nova BINARY STAR system that occasionally becomes bright at X-ray wavelengths. One member of the binary is a WHITE DWARF and the other is a low-mass giant (usually around one solar mass). Material from the giant star falls on to the white dwarf, and eventually there is so much material on the surface that it ignites (see NUCLEAR REACTIONS) causing the X-ray emission, which will fade away over weeks or months. It is assumed that this will recur, but the timescale may be decades or centuries. DWARF NOVAE have ACCRETION DISKS, so the material falls on to the white dwarf from the disk rather than from the companion star. Although the outburst is less dramatic (hence the adjective 'dwarf'), the outburst can occur frequently, even as often as every week or two. X-ray star Star that is a powerful source of X-rays. The detection of X-rays from a star usually means the star is a CLOSE BINARY system, with one member being a compact object, either a WHITE DWARF, NEUTRON STAR or BLACK HOLE (see X-RAY BINARY). However, even the Sun emits X-rays, from its CORONA, as do other stars. Massive hot O stars (such as CYGNUS X-3) emit X-rays because of their high temperatures and high mass-loss in their stellar winds. X-ray telescope Instrument for imaging X-ray sources. All X-ray telescopes are satellite-borne because X-rays do not penetrate the Earth's atmosphere. Unlike less energetic electromagnetic radiation, X-rays cannot be focused by reflection from a conventional concave mirror (as in a reflecting telescope) because, for all but the shallowest angles of incidence, they penetrate the surface. In grazing incidence X-ray telescopes the focusing element is a pair of coaxial surfaces, one PARABOLOIDAL and the other HYPERBOLOIDAL, from which incoming X-rays are reflected at a very low 'grazing' angle towards a focus. The detecting element is often a CCD adapted for X-ray wavelengths. An alternative instrument is the microchannel plate detector, in which the incident radiation falls on a plate made up of many fine tubes, rather like a short, wide fibre-optic bundle. The plate is charged, so that the radiation generates electrons which are accelerated down the tubes and together form an image that can be read off. X-ray telescopes have been flown on missions such as YOHKOH, the CHANDRA X-RAY OBSERVATORY and NEWTON.